Time to experience the magic of Antonia Burrell Holistic Skincare with this Discovery Skin Perfecting Collection. For a very special price, this handpicked precious gift set of discovery miniature sizes is sure to bring a glow to anyone’s skin. Natural Glow Cleansing Oil: thoroughly removes impurities and dirt; water soluble; removes waterproof makeup; transforms into a consistency of cleansing milk and washes away without leaving any oily residue; uplifting aroma; 100% natural, glorious, luxurious oil cleanser. Forest Dew Plump + Hydrate Beaty Water: Balances the pH of the skin; non–comedogenic; reduces inflammation; mattifies skin; reduces the appearance of large pores; prepares your skin to receive amazing benefits from Antonia Burrell Facial Serums and Cream Supreme Moisturiser. 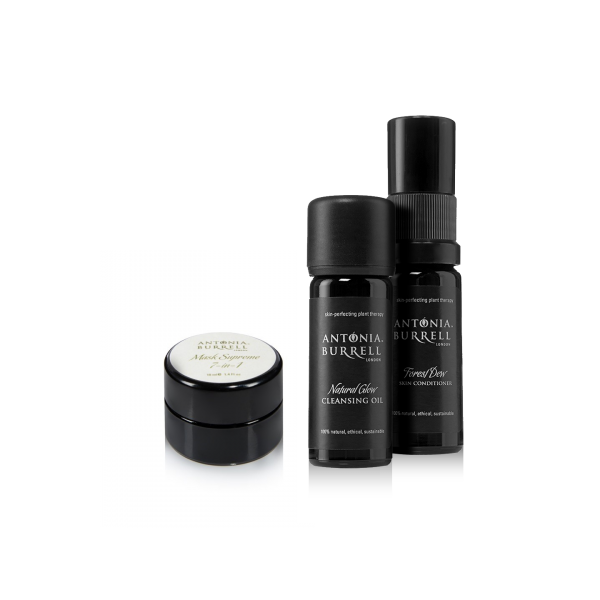 The Antonia Burrell Discovery Collection is suitable for all skin types. The products are clinically proven to yield luscious results that you'll love - leaving you smelling and feeling beautiful. Say hello to skin-perfecting plant therapy.This collection comes housed in a travel freindly pouch. · Natural Glow Cleansing Oil 10ml: the oil-to-milk formula offers a deeply luxurious cleanse, with lemon zest & bitter orange to brighten and tea tree to purify. · Forest Dew Skin Conditioner 10ml: this beautifying water contains antioxidant-rich cucumber extract to hydrate and soothe skin, while plumping up to give a natural botox effect and clarifying to reveal a dewy and refreshed complexion. · Mask Supreme 7-in-1 10ml: Moisture levels are improved and or balanced, improved hydration and nutrient retention, plus protection against skin oxidation. Smooth 2 – 4 pumps over dry face with dry hand and massage upwards. Add water and massage until all oil has turns to a white milk. Rinse away and repeat. Follow with Forest Dew Skin Conditioner. Spray 6 pumps or as much a required into palm of hand and massage into your face to balance, treat, hydrate refresh and plump up your skin. Ricinus Communis (Castor) Seed Oil, Sesamum Indicum (Sesame) Oil, Triticum Vulgare (Wheat) Germ Oil, Ethanol, Denat., Polyglyceryl-3 Cocoate, Sorbitan Oleate, Citrus Medica Limonum (Lemon) Peel Oil*, Cupressus Sempervirens Leaf/Nut/Stem Oil*, Lavandula Angustifolia (Lavender) Oil*, Tocopherol, Cymbopogon Citratus Leaf Oil, Aurantium Amara (Bitter Orange) Leaf/Twig Oil, Melaleuca Alternifolia (Tea Tree) Leaf Oil*, Citrus Aurantium Bergamia (Bergamot) Fruit Oil Citrus, Cinnamomum Camphora (Camphor) Bark Oil, Aqua, Limonene, Linalool. Lavandula Angustifolia (Lavender) Flower Water* , Cucumis Sativus (Cucumber) Fruit Extract*, Hamamelis Virginiana Distillate*, Aqua, Glycerin, Epilobium Fleischeri Extract*, Gluconolactone, Potassium Sorbate, Biosaccharide Gum-1, Sodium Benzoate, Xanthan Gum, Citric Acid.